David Gordon Green has returned from broad Hollywood comedies to smaller character driven indie dramas that make great use of well known actors in the primary role. His previous film, 2013's "Joe," was very well received and treated us to a pleasant surprise in the performance given by Nicolas Cage. Similarly to Cage's character Joe, Manglehorn is a sad, angry soul dealing with a lot of angst and regret. Al Pacino plays Manglehorn, an aging locksmith/key maker, and far more than in "Joe," Gordon Green turns the film over to the actor playing the title character. This is his film, a character study that far too often pushes the side characters away as much as Manglehorn himself. Perhaps that's on purpose, but it leads to some wasted potential for Holly Hunter and Chris Messina, who play the two most important side characters here. 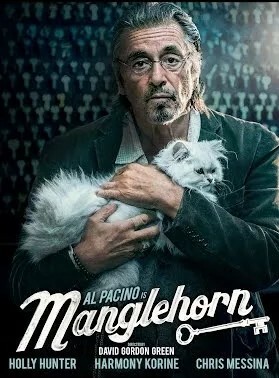 Manglehorn is shown doing his business, making keys, and helping people open locked doors. He lives a quiet life in this small town where everyone seems to know and like him even if he seems to wish they'd leave him alone. When he isn't working he's at home taking care of his cat, who is about the only being he shares any sort of relationship with. In voiceovers, he writes a diary in the form of letters to his beloved Clara. He talks about her beautiful eyes, and how much he misses her. There's a clear sense of longing for his lost loved, but also frustration in a world that would allow him to lose such a lovely companion. In fact, his anger and despondency seems to stem mostly from her absence in his life, yet as if to pile on, his son Jacob (Chris Messina) doesn't respect him much. They meet once in a while, but it's clear it's a rare thing. Jacob automatically assumes he needs money whenever he sees him, the fact of which further frustrates Manglehorn. He doesn't like what his son has become, and his petty "generosity" makes Manglehorn push him further away. He does so by comparing him to his own successes and that of people Jacob knew as a boy. However, while he pushes his son away, he does enjoy what little time he gets to spend with his granddaughter Kylie (Skylar Gasper). They spend time together at the park, where another child's birthday party is going on. A mime is on-hand for entertainment. The mime serves as a recurring visual representation of Manglehorn's soul, trapped in an invisible box and unable to communicate properly with those around him. It's one of the more whimsical elements at play in David Gordon Green's screenplay which, as usual for him, features plenty of substance between the lines for those willing to look for it. Manglehorn lives on a fairly regular schedule which includes a weekly trip to the bank on Fridays, where he makes a point to chat with the teller Dawn (Holly Hunter). They seem to enjoy these little interactions but rarely do they allow for the types of lengthy conversations they wish they could have. However, eventually circumstances do allow for longer interactions, and there seems to be a clear attraction for each other. Yet as he does, Manglehorn can't bring himself to have a relationship with anyone. He's a lonely soul, in need of companionship, if only he could allow it to develop. In a fairly painful scene, Manglehorn eats dinner with Dawn. She tries desperately to make a connection and instead he closes himself off. What holds him back is his undying love and loyalty to Clara. We're to understand that she's the source of all his pain, and the ultimate reason he can't connect with his friend Dawn, his son Jacob, or anyone else for that matter. Even if he realizes his own need for good company, he struggles to open himself up to accept that company. His love of Clara has left an expectation of what he wants or should have. He chases everyone away if they don't live up to this expectations, and of course, no one can live up to something we hold in such high regard in our memory. That's one of the funny things about memories. It's a story of learning to let go of regret and open up with what little time we have left, and while it's handled in a fairly beautiful way, it does not, however, feel like his reawakening has been earned (I'll give a more spoilery explanation after the break at the end). Rather it feels settled upon as inevitably that's the only thing left to do. Also sadly absent is a sense of Clara and the relationship he valued so much. As significant as it is to the state of the central character, we're only given snippets in the form of mournful voice-overs of diary entries. The pace is slow, and meandering. Yet it is, I feel, fitting of the aging, world weary Manglehorn. For an actor who can light up a screen and give big performances, Pacino gives a refreshingly smaller, but brilliant, soulful performance. It also features some beautiful cinematography by Tim Orr, who has served as director of photography on nearly all of David Gordon Green's projects. The beautifully moody soundtrack by Explosions in the Sky (another frequent collaborator) certainly adds another layer. The fact that it also takes place in a small town, and makes use of non-professional actors puts even more of David Gordon Green's trademark stamp on this film. It seems to be getting fairly mixed reviews by the public and critics alike, likely due to its meandering story, its dreary, melancholic aesthetic, and its somewhat disingenuous ending. Yet Pacino's performance and some deep subtleties make this an overlooked, under appreciated little film that's certainly worthy viewing for anyone following either Pacino or David Gordon Green. There is a subtle spiritual element at the core of the film, as there is several of David Gordon Green's films (I'm thinking specifically of "Prince Avalanche"). It starts with a conversation with a group of men at a pancake breakfast. He tells the group the story of a ship at sea that capsized trapping a group of children under water. He offers the story as evidence of this unjust world we live in. They were religious children travelling with a nun, who happened to be the only one to escape with her life. At the end of his story he claims he can't believe in God after hearing such a story. God didn't save these kids who had spent their short lives worshiping him. However, his change in tune comes later on when he returns home with his beloved cat, who had been suffering from stomach pains that caused her to refuse to eat. The cat had undergone surgery to remove a key found in her stomach. At long last he finds her eating normally. Out of pure joy, he can't help but exclaim, "Thank God!" The line reverberates, echoing on through the next scene as he rides through a car wash. It's a cleansing moment, not just as his van is literally cleaned, but his soul is refreshed. Following that is the image of his boat that containing all the pictures and other belongings related to Clara being dropped in the dump. It's a beautiful moment, yet again, it doesn't feel earned. Rather it feels settled or decided upon when enough was enough. Much of the film feels dreary, yet once Manglehorn chooses to reawaken his soul, that dreariness turns to serenity. He's allowed one final whimsical encounter with the mime who had been serving as a recurring visual representation of his trapped soul unable to properly communicate with those around him. Now, no longer trapped in his box, the mime tosses him the invisible key which works in a very real way to unlock a literal door.